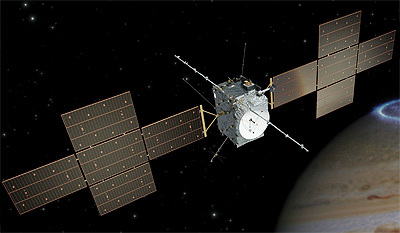 JUICE (Jupiter Icy moons Explorer), is a planned Jupiter probe, which was selected by ESA as the first Large-class mission of ESA’s Cosmic Vision 2015-2025 programme. It is to investigate Jupiter and its large icy moons Callisto, Ganymede and Europa. JUICE will enter an Orbit arounf Ganymede during its mission. JUICE was formerly known as the JGO (Jupiter Ganymede Orbiter), the ESA element of the joint NASA/ESA EJSM (Europa Jupiter System Mission). After the cancellation of the NASA sister mission JEO, it was renamed to JUICE. In July 2015 Airbus Defence and Space was selected as the prime contractor. The € 320 million contract was signed in December 2015. It will be launched in 2022 from Europe’s spaceport in Kourou, French Guiana, on an Ariane-5ECA, arriving at Jupiter in 2030 to spend at least three years making detailed observations. ESA is currently evaluating a potential shift to an Ariane-64 launch vehicle. Jupiter’s diverse Galilean moons – volcanic Io, icy Europa and rock-ice Ganymede and Callisto – make the jovian system a miniature Solar System in its own right. With Europa, Ganymede and Callisto all thought to host internal oceans, the mission will study the moons as potential habitats for life, addressing two key themes of Cosmic Vision: what are the conditions for planet formation and the emergence of life, and how does the Solar System work? JUICE will continuously observe Jupiter’s atmosphere and magnetosphere, and the interaction of the Galilean moons with the gas giant planet. It will visit Callisto, the most heavily cratered object in the Solar System, and will twice fly by Europa. JUICE will make the first measurements of the thickness of Europa’s icy crust and will identify candidate sites for future in situ exploration. The spacecraft will finally enter orbit around Ganymede in 2032, where it will study the icy surface and internal structure of the moon, including its subsurface ocean. Ganymede is the only moon in the Solar System known to generate its own magnetic field, and JUICE will observe the unique magnetic and plasma interactions with Jupiter’s magnetosphere in detail. The main spacecraft design drivers are related to the large distance to the Sun, the use of solar power generation, and Jupiter's harsh radiation environment. The orbit insertions at Jupiter and Ganymede and the large number of flyby manoeuvres (more than 25 gravity assists and flybys) requires the spacecraft to carry about 3000 kg of chemical propellant. The large distance to Earth results in a signal round trip time of up to 1h 46 m, requiring careful pre-planning and autonomous execution of operations by the spacecraft. Additionally, the spacecraft will be equipped with a high gain antenna ~3 m in diameter to provide at least 1.4 Gb daily downlink. Payload accommodation would take into account the need for radiation shielding and satisfy requirements from individual instruments. The JUICE mission focuses on Ganymede and Callisto, along with two Europa flybys, and therefore stays outside of Jupiter's main radiation belts for most of the mission operations. This means that shielding can be used as the primary protection for the onboard electronics. The use of solar array power generation in combination with the large distance from the Sun, with a worst-case solar constant of 46 Wm-2, results in large area solar arrays, of typically about 60 – 75 m2. Since the radiation environment is dominated by electrons, solar arrays can be used to provide electrical power, with GaAs solar cells optimized for 'Low-Intensity/Low-Temperature' conditions.